Need a great lure? Well you are in luck, because we are proud to be able to offer all of the over 230 lures that the Beaver Spin line produces. Yep, from curly tails, to split tails, and even standard fishing grub lures with or without legs, no matter what style you prefer you'll find it right here. And all with the superior level of craftsmanship that comes from each one of our quality lures being handmade. No mass-production here, each one is assembled carefully in Metter, GA. And since it was designed by a fisherman, for fishers everywhere, you can bet that you'll be able to find the right tool for the job, no matter what you are after. 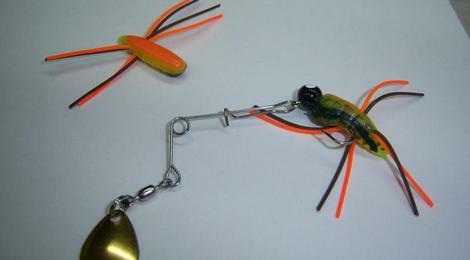 So don't wait another second to get one of the great Beaver Spin handmade fishing lures. All spinning grub lures come packed twelve to a card, and priced somewhere in the neighborhood of fifteen to thirty dollars a card, plus shipping of $5.80. And with most orders shipping the same day they are received, you have no excuses. Give Beaver Spin's line of fishing tackle a try, and we bet you will keep coming back for more!